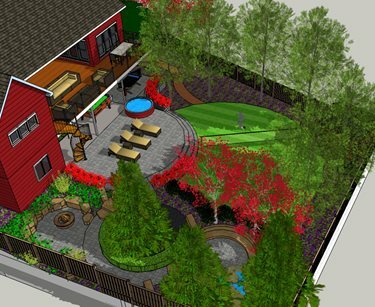 Clients consistently ask for a cozy, woodsy look for their landscaping, according to Chuck Edwards of Breckon Land Design Inc. in Garden City, ID. 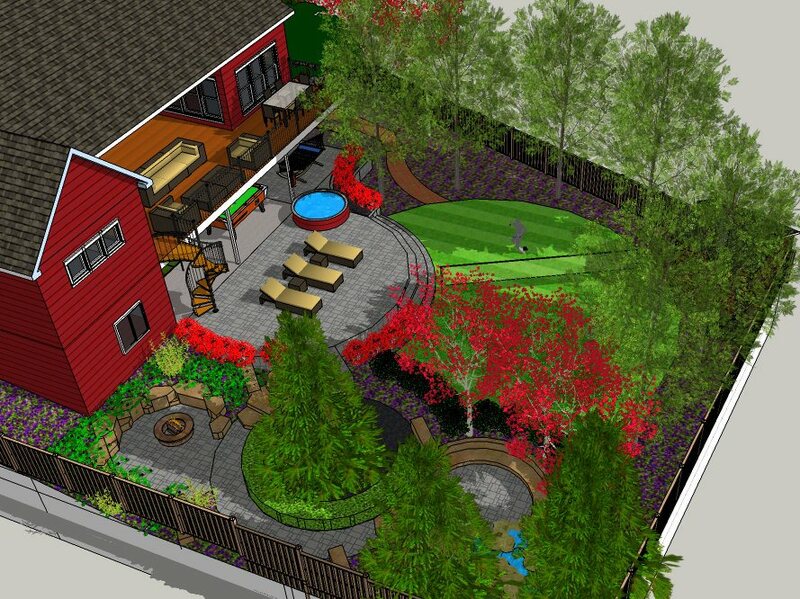 Yet integrating the straight lines of the home with a more natural setting can pose a design challenge. 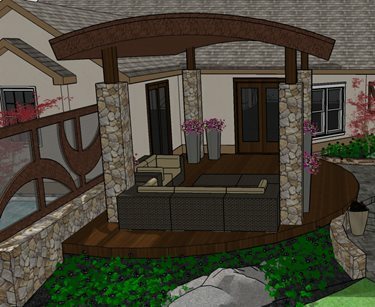 In this plan mockup, Edwards designed a second story deck overlooking a circular patio and lawn, then surrounded the landscape with evergreens and boulders for a rustic appearance. The straight lines of the deck harmonize with the architecture and are softened by the circular patio below. 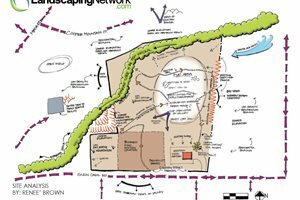 Contemporary landscapes like the one depicted in this plan use straight lines and have strong contrasts between materials. 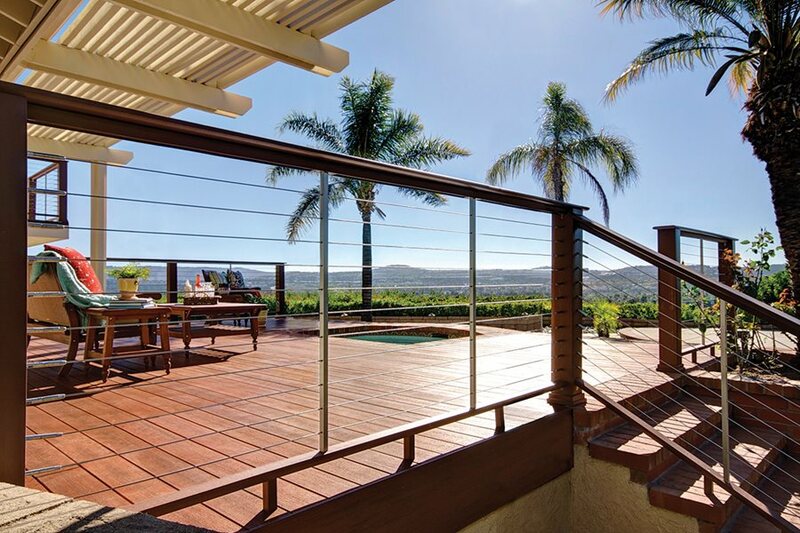 Elements that work well with a modern deck are square and rectangle shapes, concrete steps, ipe deck boards, cable railing and other metal accents, and massed plantings used in straight lines or geometric shapes. 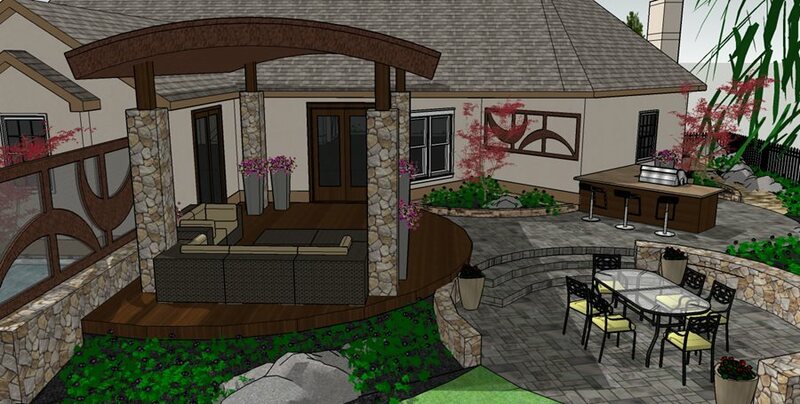 In this deck plan, Edwards specified a TimberTech deck, cultured stone walls, and a shade structure made of steel and ipe wood. The Earthwood Evolutions line from TimberTech has a number of colors that mimic the look of ipe and other tropical hardwoods, making it well-suited to the contemporary look. This landscape has a mix of contemporary and rustic elements. The curved steel with stone pillars on the pergola creates an artful blend of man-made and natural, and the art panels on top of the wall help define the space and create separate garden rooms. 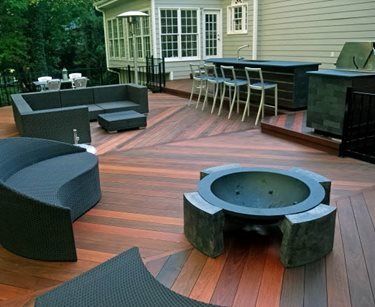 The half-circle shape of the deck echoes the curves on the patio and the art panels to give the deck an integrated look. The Cape Cod garden style blends the colors seen in the sky and the sea, and accents them with crisp white detailing for a nod towards traditional garden design. 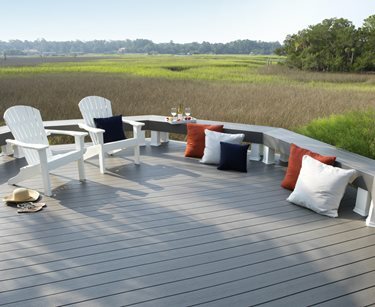 On this deck, TimberTech’s Earthwood Evolutions capped composite boards in the Slate color mimics the gray color of weathered ipe wood, and makes a relaxing pairing with the gray blue of the sky beyond. In coastal landscapes, you never want to impede the view. Here, a low bench provides seating and a feeling of security without blocking the scenery, as many types of railing would. 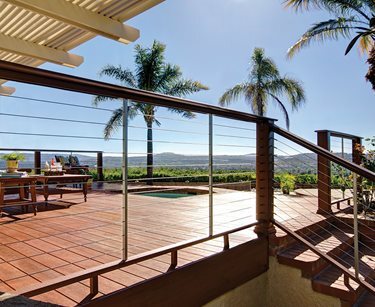 In this coastal landscape, cable rails frame the deck and provide safety without blocking the view from your deck chair. 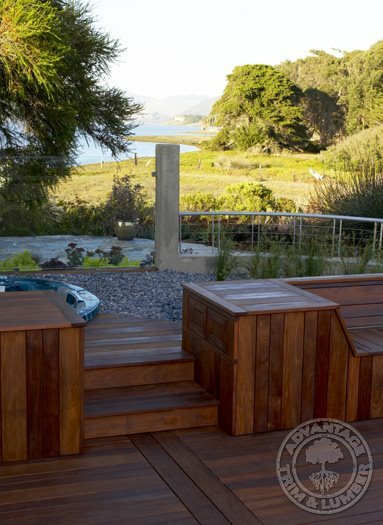 While tropical hardwoods such as ipe are traditional, many contractors recommend capped composite products instead to get a similar look without the regular maintenance required for wood decks. In this photo, TimberTech’s Earthwood Evolutions product in Pacific Rosewood color has the warm tones of oiled ipe, yet needs only periodic washing to continue looking good. “The typical 10’ x 10’ builders’ special deck is completely useless,” says Edwards. 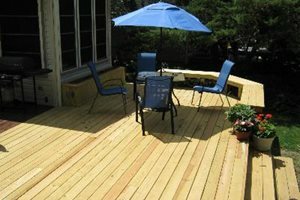 “I wouldn’t build a deck less than 15’ x 15’ at minimum. I’ve never had a single client who wished they’d made the deck smaller.” The sizing of your deck will have a lot to do with the architecture of your home, the available space in your landscaping, and how you want to use the space. If you entertain a lot, remember to keep circulation in mind as you’re designing. A 5-foot pathway or stairway is the minimum width for people to be able to traverse the area without feeling too close. A 3-foot-wide path always gets congested, while an 8-foot-wide path gives plenty of room for multiple people to use the space at once. 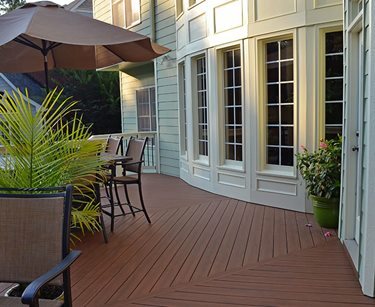 There are a number of deck accessories which can be built into your deck to make it more useful and attractive. The seat of a built-in bench can act as a lid for a storage box for pool chemicals, towels, gardening tools and other errata. Built-in planter boxes can frame seating areas and help break up long straight lines. 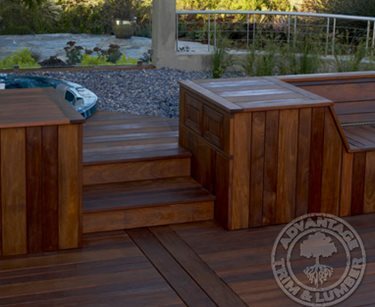 Unfortunately, “built-in benches and planters make the prices skyrocket,” says Edwards. “Unless we’re going for a contemporary look, I often prefer to spend the money on creating curves on the deck instead, and just buy furniture and pots.” That said, if you have a tight space or simply like the look of built-ins, it can be a worthwhile expenditure. Fire pits are another possible addition. 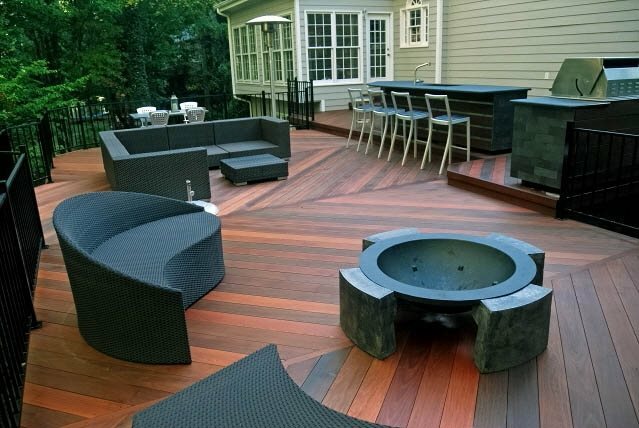 Baron Biedenweg of Archadeck of Fort Wayne in Ft. Wayne, IN suggests using a gas fire pit to avoid any concern about embers marring the surface of the deck. 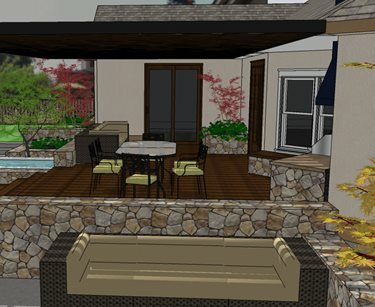 When you’re thinking about creating areas for entertaining on your deck, you can use a number of techniques to visually define the space and encourage gatherings. 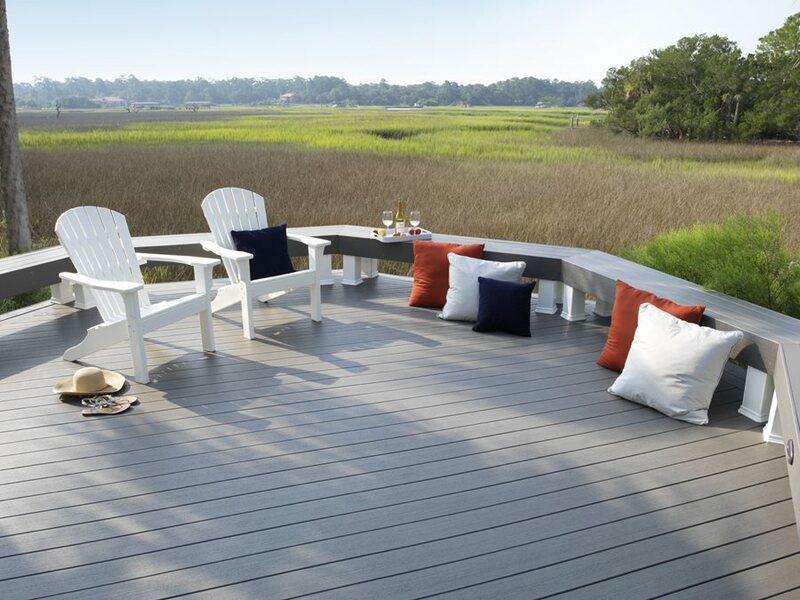 On this deck, Bobby Parks of Peachtree Decks & Porches in Alpharetta, GA used grade changes near the house, and set the deck boards in a pattern to create distinct seating areas. 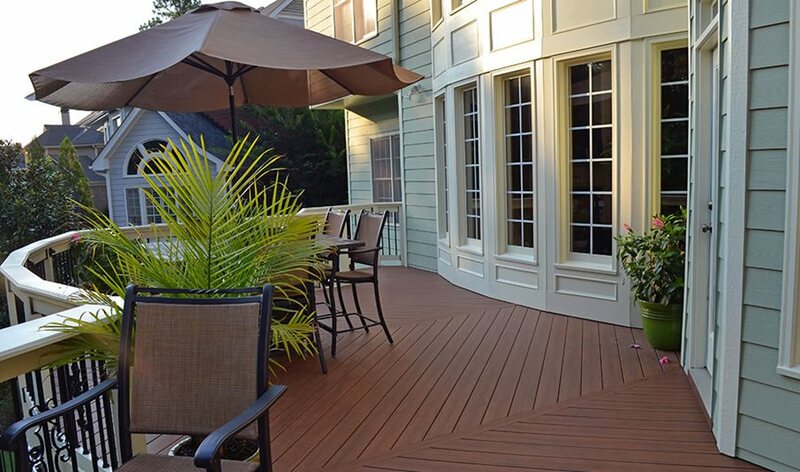 “Diagonal decking also does a lot structurally to stabilize the deck. It’s not just for aesthetics,” he says. On this deck, a fire pit, bar and ample seating makes for a gracious and inviting space for enjoying the company of friends. 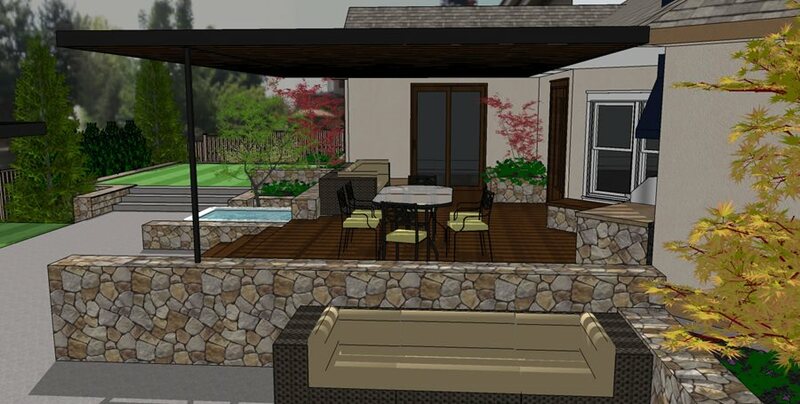 Creating a deck surrounding a spa adds significantly to the cost of the project, because your contractor will need to create a support structure such as a concrete pad to hold up the spa, before they build the entertainment deck around it. 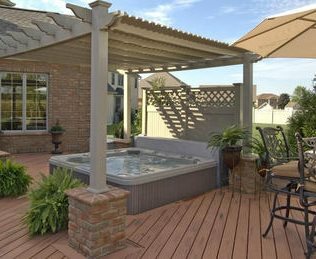 On this deck, Biedenweg used a shade structure as well as a privacy screen to create a comfortable spot for hot tubbing. 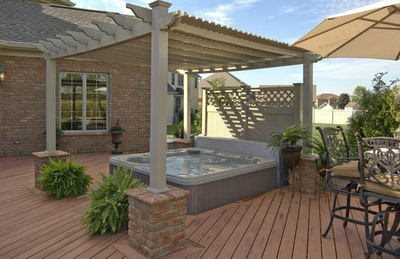 When building a spa deck, he says that most people choose capped composite boards because they are so low-maintenance, but any material can be successful in that setting. On this pool deck, a capped composite material was chosen to surround the pool. A large shade structure wraps around one end of the pool and covers the seating area so guests can relax before or after their swim. 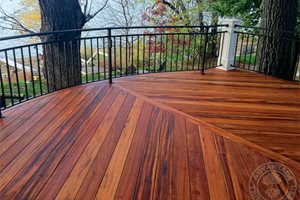 When using composite decking, composite railing systems are a great choice because you can choose a harmonizing color and know that your railing material will be as low-maintenance as your deck. 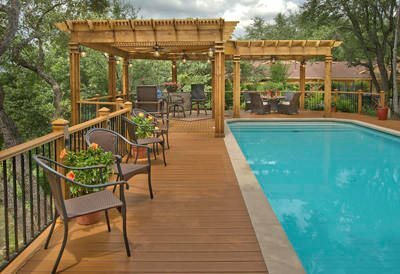 Biedenweg points out that most brands of composite decking are ADA-certified for their slip resistance, so they’re a safe choice for around a pool.